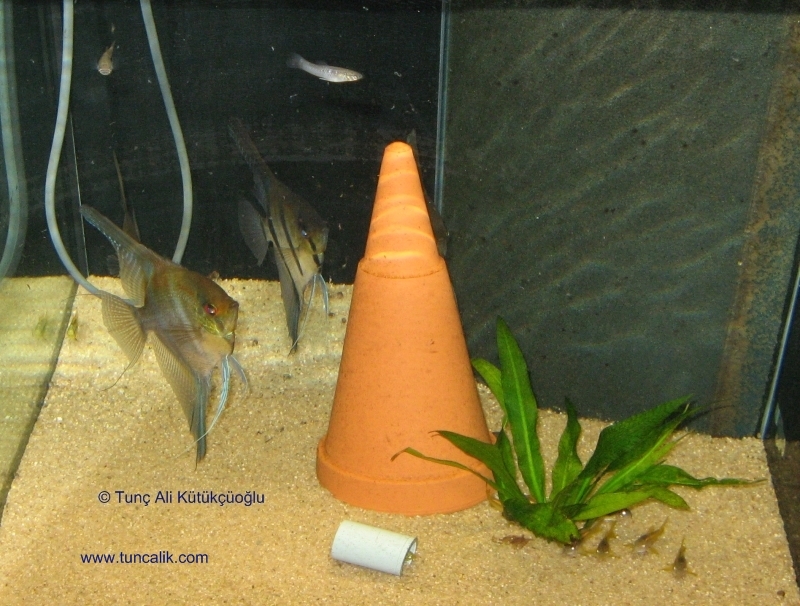 As a student in Turkey I was every time taken aback when I read in aquarium books and magazines that angelfish (Pterophyllum scalare) was one of the most popular aquarium fish. 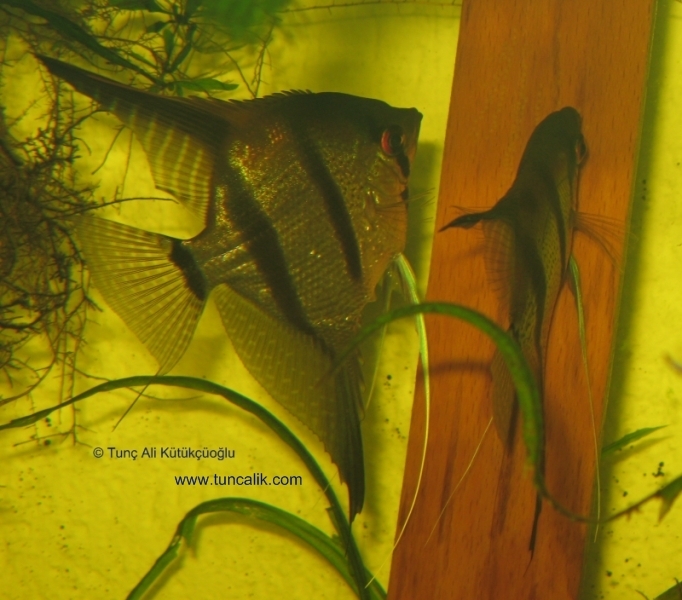 All the selective-bred angelfish races I saw in aquarium shops like the smoke angelfish, white sailfins, triple colors and so on, looked so sluggish, artificial and unhealthy. I thought “people have strange tastes!”. 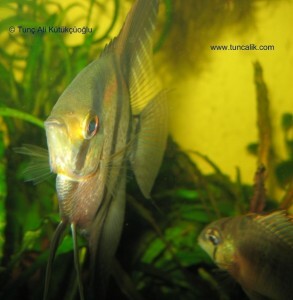 I change my mind radically when I began to keep natural races like Peru altum, and another natural form with Columbian origins, which I named Columbian angelfish. 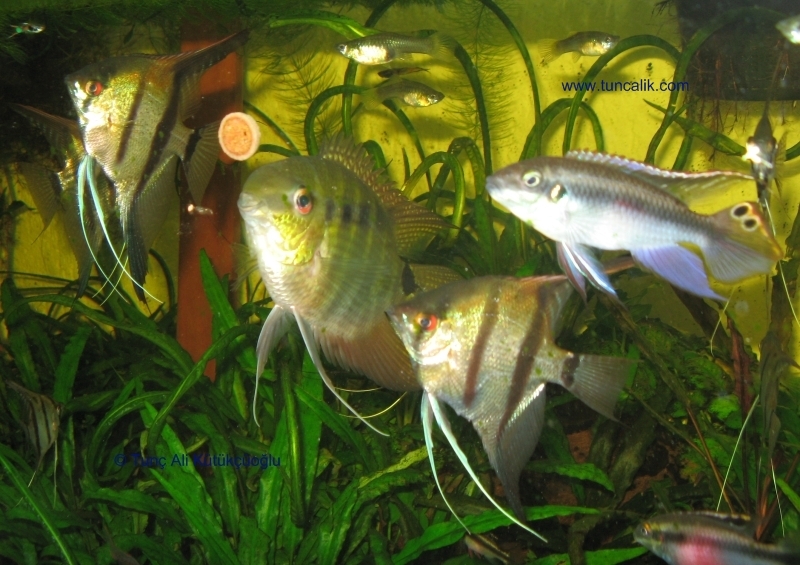 They are absolutely beautiful, interesting and healthy fish, of course, if kept under proper conditions. The iridescent metallic greens and blues concentrated on the head are best seen under natural sunlight. 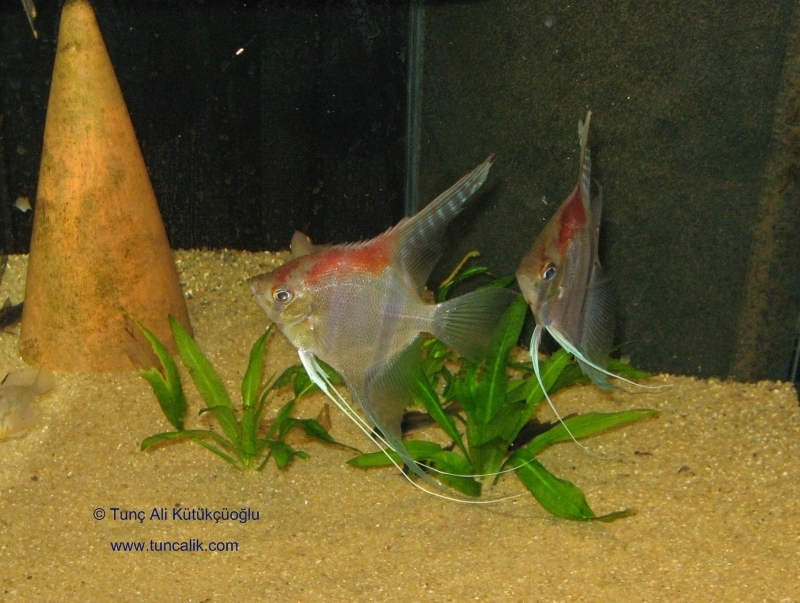 You will find here an image gallery of these natural races including the red back angelfish kept by a friend. In my personal experience, Peru altum is a sensitive fish. It requires higher temperatures and frequent live food. 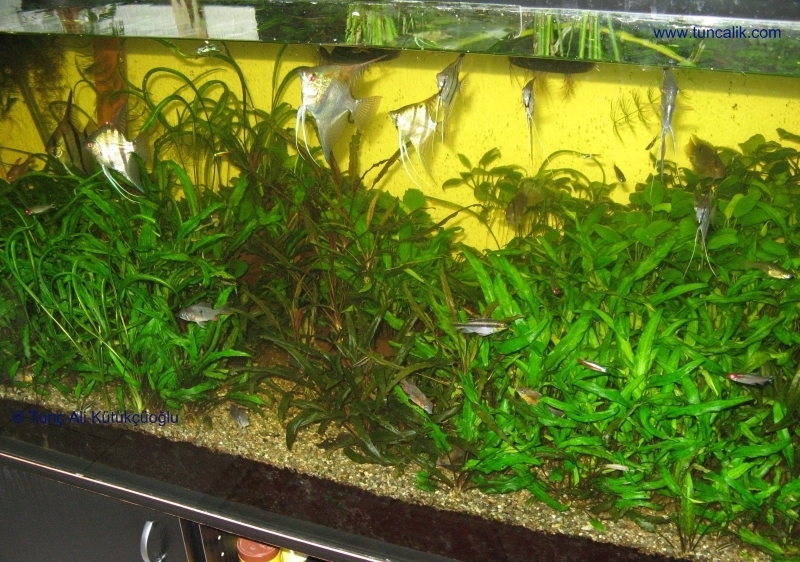 I bought eight young Peru altum (2-3 months old) seven years ago and put them into my large community aquarium. At the beginning they all grew well. But after several months, as the dominant fish made themselves noticeable, the subdominats became stressed and sickly, and began to die one after another. At the and only the most dominant pair survived. And the same story happened to me twice. I guess, Peru altum is in nature either not a gregarious fish in the breeding season, or each pair requires a large territory which might cause problems in a home aquarium. 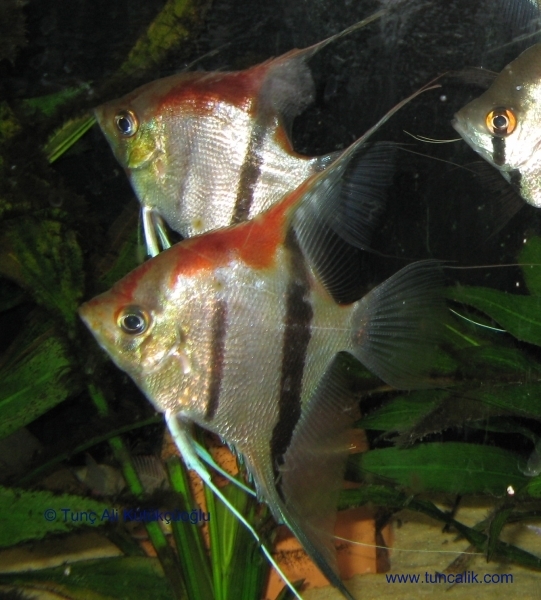 The Columbian angelfish is -maybe not as majestic as Peru altum- is also a very beautiful fish. And it is robust. I had bought eight young fish and all grew well and healthy. Because they are not (yet) spoiled by artificial breeding they are also good parents. Really a joy to watch in a large aquarium. A 400-liter (100 US gallons) tank should be the minimum size for a group of 6-8 adult fish. The red back angelfish is also a sensitive race concerning water conditions and food, but they are apparently more gregarious then the Peru altum. What I heard, they can grow quite big in a large aquarium. Many hobbyists think red back is the most beautiful race, but I find Peru altum most beautiful, Columbian angelfish most enjoyable to watch. I would appreciate if you share your experience with these angelfish races. 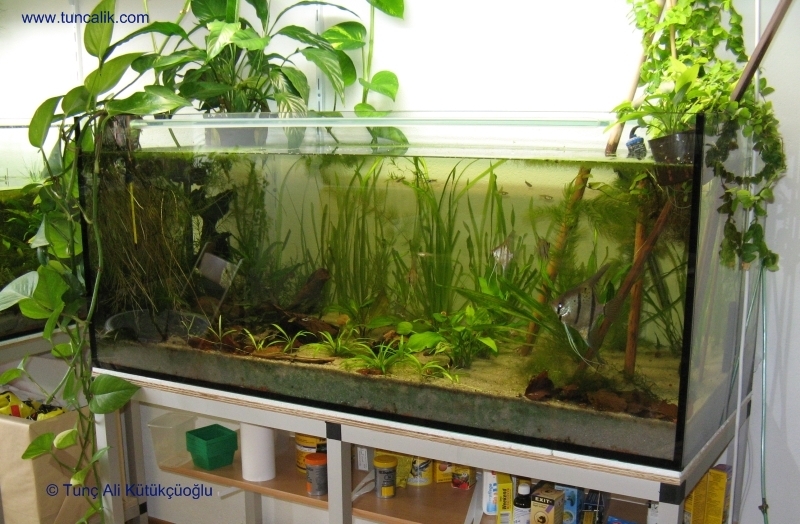 This entry was posted on Sunday, December 13th, 2009 and is filed under Natural aquariums. You can follow any responses to this entry through RSS 2.0. You can skip to the end and leave a response. Pinging is currently not allowed. Hi Tunc, I am also living in Switzerland. Where did you find those angelfish? 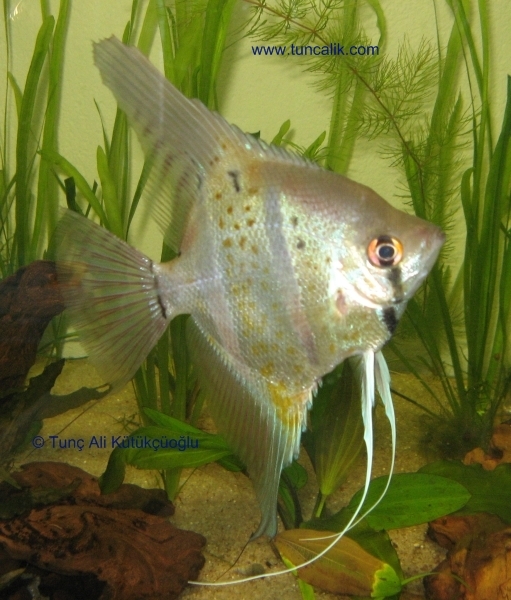 It is very difficult to find wild form young angelfish. I found them from an amateur breeder in Zurich. 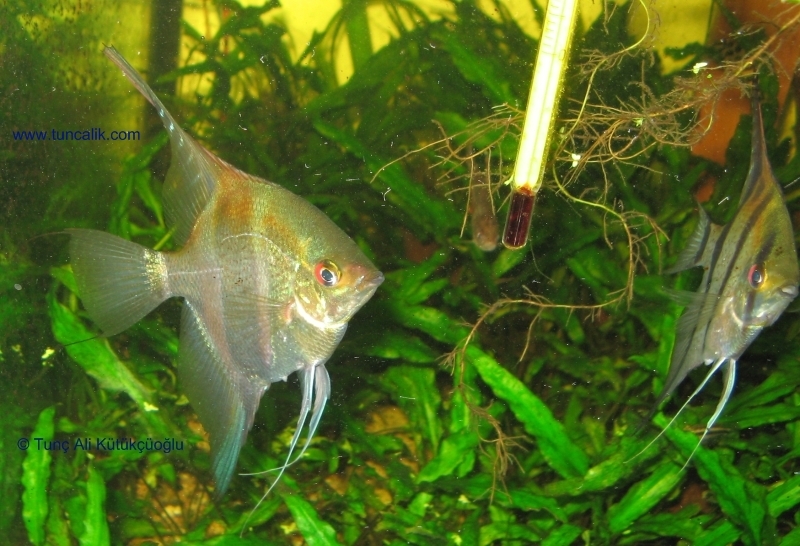 See the classifieds in http://www.aquarium.ch, the central aquarium forum in Switzerland. 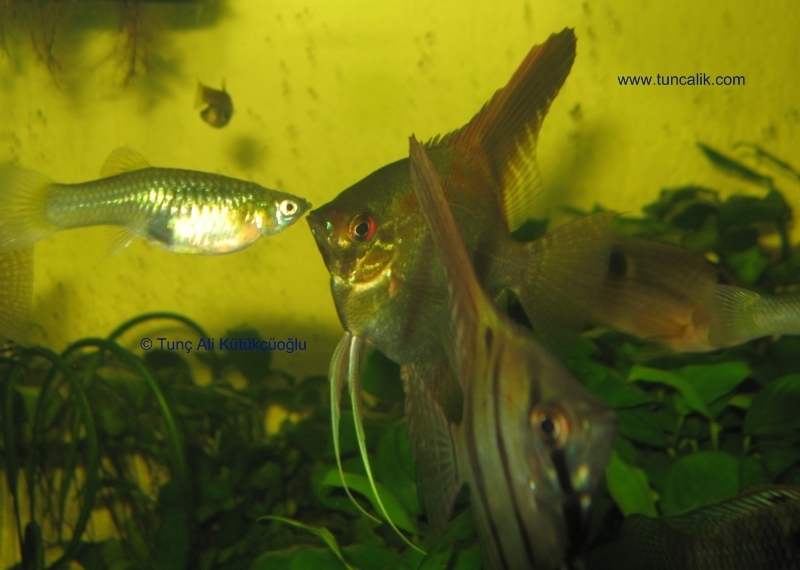 I had a trio of wild caught Peruvian Angels (adults when I got them), now several years later w/ only one left. I decided to add another cichlid (a Salvini) to the tank where the last one resided, but it didn’t work out too well. At first the angel was dominant, then as the juvenile sal grew, it grew too aggressive & I had to relocate the angel. He had been so used to getting lots of live foods in the low tech tank he was in (black worms, lots of fry), and when I moved him into another low tech tank- one that didn’t have much in the way of live foods growing in it, he sort of went on a hunger strike. I finally have him eating well again & accepting some flake & frozen & freeze dried foods. 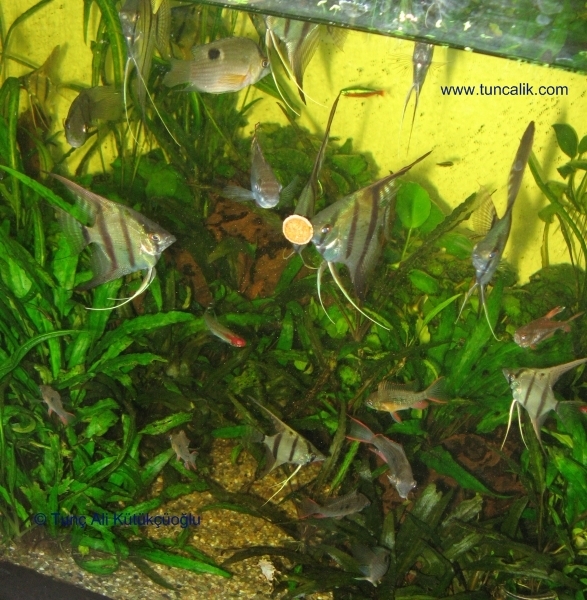 The Diamond tetras in this tank compete for the baby endler fry I add to it often. The angel is just not as fast as them, but he does get some. And, I’ve found that he likes some sort of worm-like critter that grows in my compost bucket. It is segmented & has a very hard “shell” casing. Only he seems interested in these. Those are beautiful. Are there restrictions on what fish you have in the united states? I don’t think I can make it to Switzerland any time soon. Hello. I currently have some F1 (born from wilds) Peruvian red backs. They’re still younger so the red back has not fully developed yet, but you can already see the red speckles where they will be in the future. I’m sure once they mature or reach sexual maturity, their backs will be bright red/orange. The Peruvians are naturally wild and skittish. 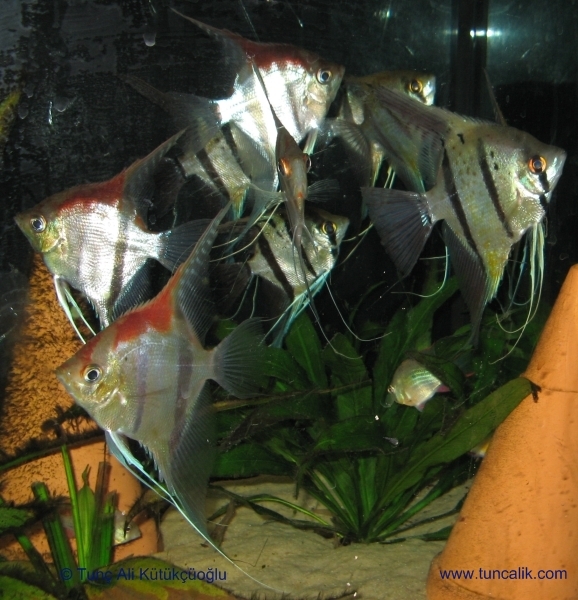 I put them in with my Pterophyllum Leopoldi (also called Pterophyllum dumerilii) and while the Leopoldis are true wild Angels, they’re older and used to humans so they help settle the Peruvians into the tanks.